The following photo nearly got me arrested. It’s not a joke, I’m serious here. 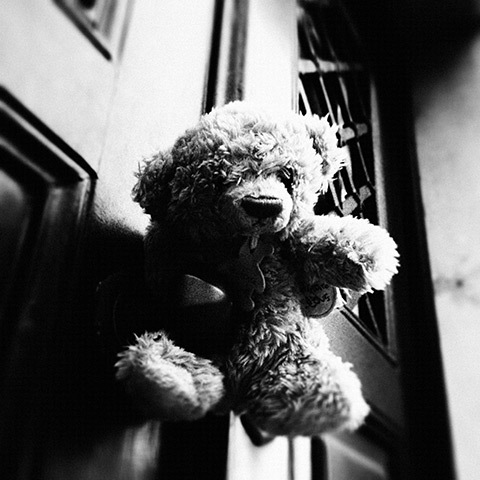 As everybody can see, it is a very innocent shot of a stuffed little bear hanging onto a door knob. It’s not a memorable photo in itself, it’s just one of those “oddities snapshots” everybody takes once in a while. As I see it, the story behind it goes as follows: a child drops the fuzzy critter on the sidewalk without being aware; later that day somebody finds and puts it where everybody will be able to see it, including its owner. In the evening I took Mr K, our marketing strategist—I mean, the dog—to the adjacent park. The bear was there. I stayed in the park for a good couple of hours and as I was going back I noticed the bear was still there. Hence I though taking a photo of the poor fellow was going to be OK. After all, the bear was apparently nobody’s and he looked pretty bored, facing down all the time on his lonely Saturday night. The problem is the knob he was resting on was not a normal knob. It was in fact a rather important knob, that is the knob of Portugal’s Prime Minister’s residence. As I was kneeling down holding the iPhone in my hands, I adjusted a bit the exposure as it was getting dark fast, and tried to frame the bear. I even entertained the little fellow with small talk while I was shooting him! So you see, I was taking it easy and I didn’t think for a second you cannot take photos of official door knobs as if they were your bathroom’s. As soon as I was walking away, a policeman was calling from behind my back and started questioning me. He wanted to know what I was doing and if I was responsible for the sulky looking bear, etc. As a first reaction, I was stunned. But wouldn’t a crouching person in beret and sunglasses after 9 PM who’s messing about with a puppet in front of the Prime Minister’s house in times of financial crisis look at least slightly suspicious to you, especially if you were a policeman? Well, in all likelihood it would, but I was so unconscious of my posture and appearance and of logical implications that I didn’t think about it for even a second. I had no clue about what was going on, I just denied. Thankfully a witness, a nice lady who happened to be passing by while I was taking the photo, confirmed that I was just taking a picture with the phone. She insisted so vehemently that the policeman was finally convinced that I was not a terrorist, that the bear was not mine and that it probably wasn’t a bomb either. I didn’t get arrested after all, I wasn’t fined and, even better, I didn’t have to give up the phone with the picture! Huzzah! The policeman grabbed the bear and arrested him instead. Because bears are not supposed to walk freely around the city center and hang around government buildings, you see. Thankfully the Portuguese are more relaxed than others when it comes to these situations and I didn’t have to get to the “I want to see my lawyer!” sort of talk you hear in movies. I don’t blame the guy for doing his job; instead, I feel stupid for not envisioning possible consequences on the basis that a camera phone is not an obtrusive tool, that almost everybody has one so you’ll get away with it easily, and that paranoia is not yet spreading around Southern Europe as in other places—these are not, however, conscious reflections, they’re more or less effect of ingrained habits. All in all, it’s useful to get a reminder to break the habit now and then. Live and learn, and leave stuffed bears alone, unless you know them personally. Reads hilarious, but I am sure it must have been a terrifying experience as it unfolded…. Well, maybe we should have a sequel. The story will be about me trying to rescue the bear from captivity from a labor camp in Siberia. There will be lots of action, explosions and I will be played by Bruce Willis (it must be him, I’m old fashioned like that).